Wednesday Windows: Figs, Oils, and Photos — Ginger writes. My friend Jaime is the person who first introduced me to the ideas of "margin" and "open windows." The two topics are not necessarily related, but they are both extremely helpful. Margin is having enough blank time in your life that when something goes wrong or a task takes longer than expected, you don't beat your head against a wall out of frustration. You don't flip out or cry or yell at your kids. You have built-in protection against these tendencies because you haven't said Yes to everything. Open windows are unfinished pieces of business in your life, things that are not on your daily to-do list but on the sticky note that you move from one day's list to the next day's list because you're never quite able to get any of them finished. Rather than rewrite the open windows list every day, you save time (and create a tiny bit of margin) by putting them on a sticky note and moving the sticky note page to page. Open windows are those things you'd talk about if you went on a date night with your husband. They're the things you think about in bed at night or while taking a shower or a walk. They're the things you are always trying to figure out how to make happen or how to be resourceful so somebody else can make them happen for you. Open windows are open until you find resolution, until you take the time to research or find a babysitter or make a decision. Yes, open windows requires decisions. They are not the easy things like texting Jill some sitter names or printing Esther's email or making a Walmart list or giving the kids water kefir grape juice with their dinner tonight. My open windows this week (or this month) involve making plans with a couple friends, sorting school supplies with the kids, looking at some baptism pictures of the boys that TJ put in Dropbox, and the three that loom largest: Figs, Oils, and Photos. Figs - I think something is wrong with the fig tree at our front gate. If you know how much I love figs, you may pause for a moment of silence and prayer. There is a rotten smell emanating from the tree currently. 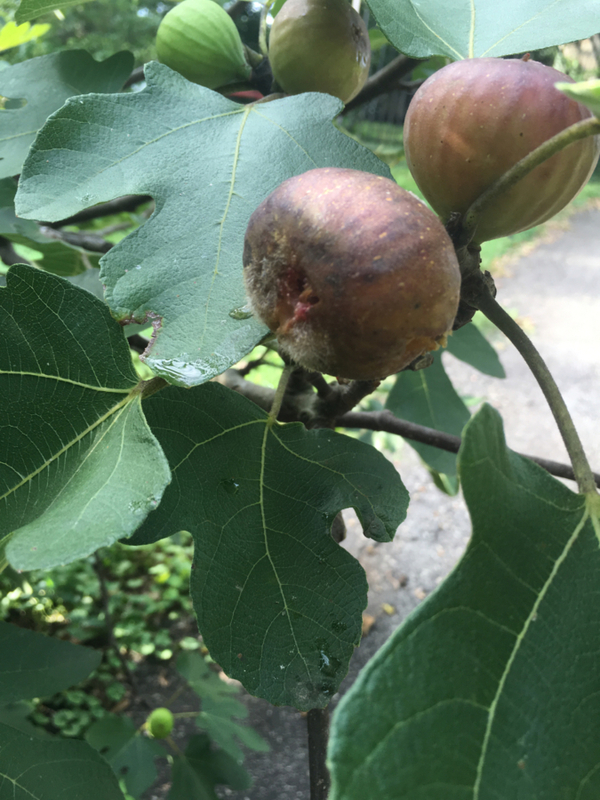 Bugs and bees are buzzing around like crazy, some figs have a white furry coating, many are shriveled up and half-eaten/half-rotten, and some figs are oozing milky beads of liquid. A friend of mine saw the tree recently and thought the markings on some of the leaves might indicate a problem. Another gardener I know suggested I call the Clemson Extension Service, so I've done that just now and am waiting to get some feedback and advice. Oils - I have started down the essential oils road. There is fog ahead and I have about four different maps. My one friend buys Young Living, while another friend says don't spend three to four times the price when the cheaper brands work just as well (she said she has tried many different brands, including YL, and likes the cheaper ones just as much). One night last week, I was literally only one click away from becoming a member of YL and ordering their starter kit. Even with a $20 coupon code (and zero pressure) from my YL friend, I couldn't pull the trigger. I realized in that moment that I really don't want a whole bunch of oils to figure out what to do with. That would be more open windows and I just need to close this one. What I really want is to make a lice-resistant spray to use as a preventative measure on my kids' hair during this school year. I also want to make a homemade deodorant, perhaps as simple as adding a couple drops of essential oils to coconut oil and applying it just like that, as my friend Tab does. Last, I want to buy a diffuser or two and diffuse some oils in the kids' bedrooms any time they get a cold or other congestion (and also rub the oils on the soles of their feet for good measure). That's basically it, so I think I've narrowed down the ones I need to Lavender, Tea Tree, Lemon, Sandalwood, Peppermint, and maybe Rosemary. To close this window I'll need time on Amazon, Piping Rock, and Mountain Rose Herbs, along with not as much money as Young Living requires and a commitment to use what I buy. 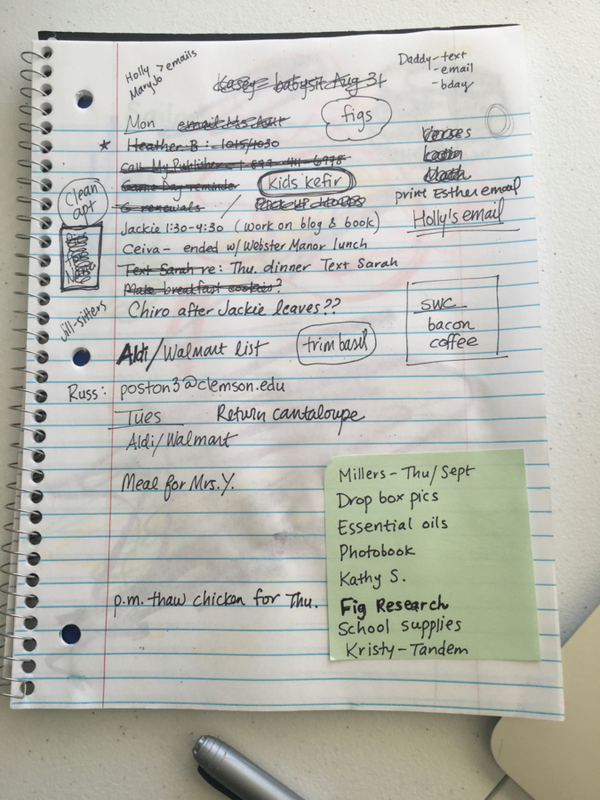 I'll also have to find recipes for a lice spray and deodorant. Photos - This is different from my earlier mention of viewing the baptism pictures of the boys from earlier this summer. The sneak preview picture TJ texted to my phone the other day is pretty sweet. The more pressing open window is to finish the photo book I'm making in My Publisher from our last year living in Naperville. We moved 18 months ago, so I'm going back a full 2.5 years in pictures to get this final installment done. I forced myself to get moving when I purchased a $40 voucher ($60 savings) in July that must be used by the end of October. I knew I wouldn't make the book any other way - not with writing and homeschool and figs and oils - but now I have to. I get to. I'm happy to. None of the above includes my #1 open window which is the book proposal I have been working on and had hoped to have done by the end of August. God, help me. Just getting the word out on what's clogging up my brain at the moment is helpful to my psyche. Plus, TJ can read it, and it's almost like we had margin for a date night.